CHARLESTON, S.C., Dec. 18, 2018 — (PRNewswire) — SkuBot will debut two new 3D scanning and product recognition systems for consumers, tradesmen and retailers that use its computer vision platform and product ID system to recognize hard to identify parts in seconds from hundreds of manufacturers. SkuBot's parts identification system, powered by HP, identifies maintenance repair parts by their unique physical shape with 98 percent accuracy. SkuBot will be at CES, January 8-11, Venetian Hospitality Suites and at ShowStoppers, January 8. Utilizing the latest 3D imaging technologies, SkuBot's patent pending system scans an item, creates a digital model and compares it to their virtual library in the cloud containing thousands of 3D models of maintenance repair parts. Once SkuBot recognizes and locates the item it is displayed on the terminal and advises if the product is available in store or needs to be shipped. 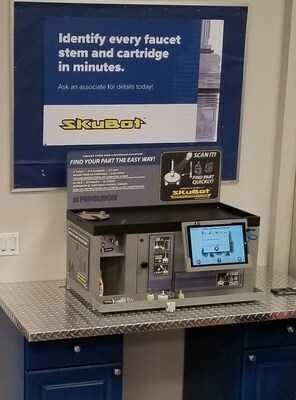 The first generation of SkuBot is currently available at 11 Ferguson locations nationwide. Most wholesalers and retailers do not have the resources to identify or source anything other than high frequency items. SkuBot's user interface is easy to use, intuitive and helps both store associates and consumers find obscure parts easily. SkuBot eliminates searching through catalogs and traveling to numerous locations in search of the right part. "SkuBot is the first commercially deployed end-to-end 3D product identification sensor that is able to solve the common problem of parts identification faced by wholesalers, retailers, DIYers and tradesmen," said Keith Meany, president, SkuBot. "Our next generation product offerings are small, sleek and more efficient. Together with HP and our first customer, Ferguson Enterprises, we are continuing to bring the latest innovation in 3D product recognition to our customers." "We continually have trade professionals and consumers looking to replace parts with no identifiable markings or logos," said Lance Buffington, business development manager at Ferguson Parts and Packaging. "The skills to identify parts are highly specialized and with SkuBot's 3D scanning device our sales associates can help customers identify parts along with any associated items quickly and accurately. At Ferguson, we pride ourselves in working with innovative companies that bring new technologies to enhance our customers' experience and SkuBot's technology does exactly that." "We are delighted to be working with the SkuBot team to bring smart object detection and product identification technology to wholesale and retail environments," said Steve Smith, senior director of engineering for HP's Immersive Computing Division. "Using the latest 3D sensors, machine learning and computer vision technology SkuBot can identify hardware parts without barcodes or tagging. We are collaborating now on a next generation system that will have a new interface along with increased accuracy and speed of identification."